There are just some days when all the Boy and I would like to do after a hard day at work is to put our feet up, spread out on the couch and ignore each other for a while whilst maintaining the comfort of having each other close by. It’s probably one of the reasons why I love spending time with him so much. I get to read my books whilst he potters on his computer or his phone. When I say I read, I mean read. I get completely absorbed in the fantasy world I am reading and completely ignore the world around me. Completely. I nearly missed my train stop today on the way to work as I was shrouded in a story of assassins, royalty and intrigue. When I get into a story that deep, it is usually really hard to rouse me back into reality. The Boy has spent years honing his skills to slowly coax me out of my dream-read state. I’ve been brought out of my deep reading slumber with delicious smells emanating from the kitchen. Once when this happened, I discovered the Boy was experimenting with some left over pork belly and caramelising it over the kitchen stove. 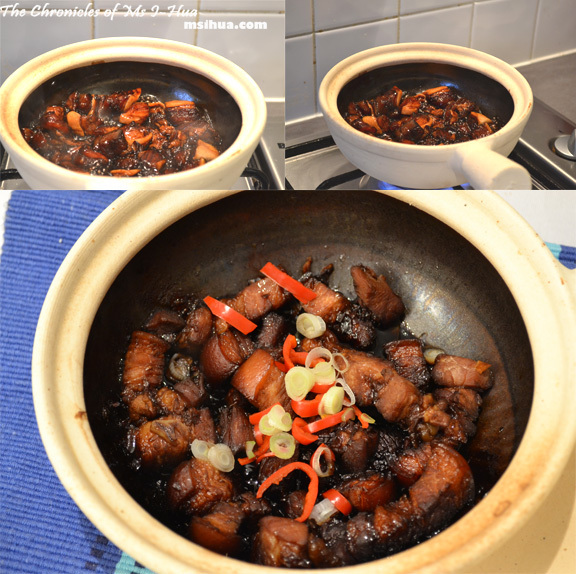 The pork belly is braised in a claypot with garlic and onions and a mixture of dark soy sauce (Cheong Chan Thick Caramel Sauce), oyster sauce and light soy sauce. Braised in a claypot (covered) until tender. I swear, the resulting effect was that after the meal, we were both in such a comfortable sleep-like stage with protruding bellies (okay, mine more than his :P) but very happy and contented with life. Another favourite comfort food of mine is steamed egg custard. Heck, I love eggs in all shapes, sizes and forms so it’s no surprise really. 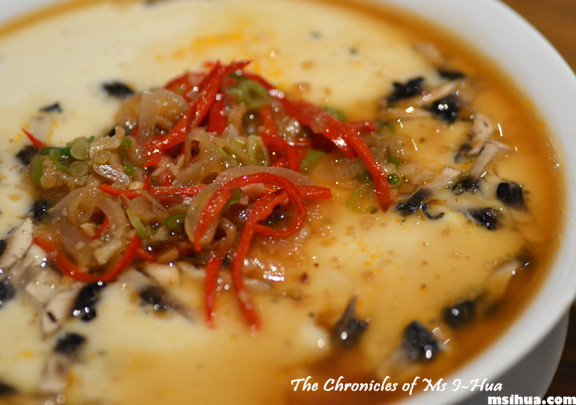 The Boy’s version kind of reminds me of the Japanese egg custard dish, chawanmushi. To make this dish, beat 3 eggs with 150 ml of chicken stock and 100 ml of water. Add thinly sliced mushrooms. Season with salt and pepper and steam over low heat for 10-12 minutes. 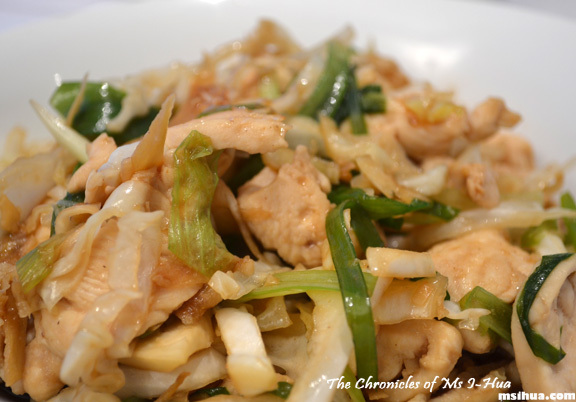 Garnish with stir fried onions, spring onion, sliced chillies and light soy sauce. Homecooking for me usually means taking a little bit of my memories of home cooked food and replicating Madam Mummy’s or my Po Po’s food. It never is quite the same but we try our very best. There are some dishes which you would cook and upon first taste, you are blasted back to a time when you were a small child eating with your elders around the table. These kind of foods usually give me a warm fuzzy feeling deep inside. There’s nothing more comfortable than visiting your mum or grandma and knowing you will be fed well! For our version of our mothers’ stir-fried dishes, we attempted the following. Marinade chicken slices in Shao Xing wine, sesame oil, oyster sauce, light soy sauce and cornflour. Stir fry ginger and garlic until fragrant and add marinated chicken pieces. Once chicken is almost cooked, add some chicken stock, dark soy sauce (Cheong Chan Thick Caramel Sauce), sesame oil, Shao Xing wine and sugar. When almost done, add in spring onions and slurry (mixture of cornflour and water) to thicken the sauce. Sometimes being lazy and wanting comfort food results in lazy but delicious stir-fries. This usually involves one of us raiding the fridge and the other one just slicing, dicing or chopping whatever that lands in the way. Depending on our mood, one of us will get the wok out and proceed to fry up something quick and yummy to serve for dinner. For the dish above, stir fry garlic until fragrant and add in pork slices, mushrooms and carrots. 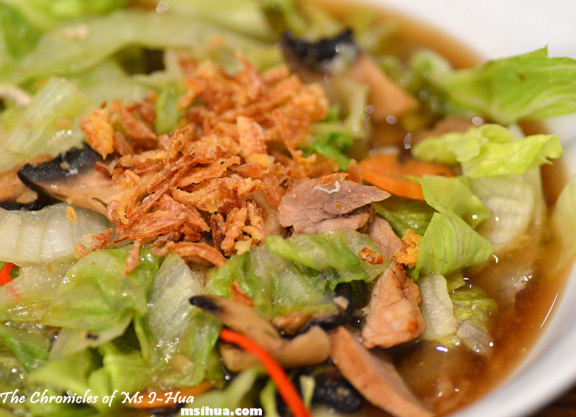 Once pork is almost cooked, add in chicken stock, light soy sauce, oyster sauce and lettuce leaves. Garnish with sliced chillies and fried shallots. All the above dishes would be most enjoyable with a big bowl of steamed rice. However if rice is not your thing, noodles (of any kind) would be a great alternative! We hope you enjoy our foray into comfort food. Not everything needs to be overcomplicated with cooking! Sit back, enjoy and be comfortable! Okay so you’d think that the fact that I don’t eat pork, my hubby doesn’t like ginger and neither of us like mushrooms would really leave me with nothing to say about this post BUT 1 – I’ve learnt my lesson about that 🙂 and 2 – I’d really, really like to know what book you were reading, if you don’t mind sharing that information. Hahahaha… on all the things you don’t eat! Oh and I was reading a fantasy novel 🙂 It’s always a fantasy novel.. Now I’m doing the epic read of The Queen’s Blade on iBooks.. such a good read! Hannah recently posted…Cedar City Dining: Chili’s and Denny’s and Greens, Oh My! 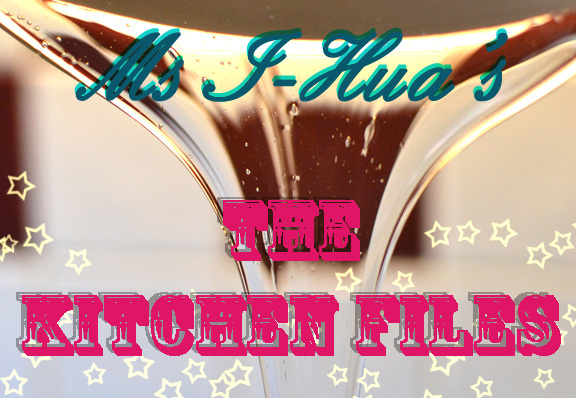 You’re so lucky I-Hua with The Boy making so many yummy dishes at home! That Claypot pork belly looks awesome. Seeing as Gaz has honed his skills making claypot rice, no point me trying. You can just invite me over and cook this for me. Kthxbai.